This is a popular phrase encouraging a person to make the best out of the difficult situations we experience in life. The encouragement is to look for the life lesson to help a person cope and give a person strength and knowledge to better face future challenges. However, when God gave David lemons, he didn’t stop at optimistically searching for the good in the struggles he encountered. His end goal and focus was to seek and find God amid these sour seasons. Our Lord is the One who brings us through these experiences, drawing us closer to Himself and His plan for us. We must be careful not to make the focus of the Christian life about having the best life experiences. Our focus instead should be the life of Christ and our best life in Him. Psalm 118 is another psalm most likely written by David after facing many trials but now taking his place on his anointed, kingly throne. He gave thanks to the Redeemer for his rescue from oppression and for his advancement as king of Israel. He invited everyone to praise God for His goodness and to trust God, making note of his own experiences of receiving God’s tender mercy and mighty power. Even when things were going well, David was sensible of his obligations. He knew he was not his own self-made man and king, but bought with a price and appointed with a purpose. Therefore, he was more driven than ever to praise God, for he knew his whole success depended upon Him. Psalm 115 reveals the heart of a psalmist when the church was faced with persecution by its enemies with insolent mocking and the dismissing of the former miracles of God. Though it surely grieved God’s people that God would be so dishonored, they did not worry themselves over their own persecution as children of God, but rather they called on God to vindicate His own name. The psalmist exhorted the people to trust God and bless His name and to make sure He was not robbed of His rightful praise. Psalm 116 is another thanksgiving psalm where we find the psalmist grateful for experiencing the goodness of God in and through the great distresses that nearly drove him to utter despair. Psalm 117 is short and sweet, but full to the brim with the encouragement of all mankind to praise the name of the Lord. David and all the psalmists surely desired their lemons to be turned to lemonade, but after searching themselves through and through, they realized there wasn’t anything in and of themselves that merited the comfort, support, and benefits of God. Instead they asked God to deliver them and grant their requests for His name’s sake, that the glory and praise due Him might be maintained. 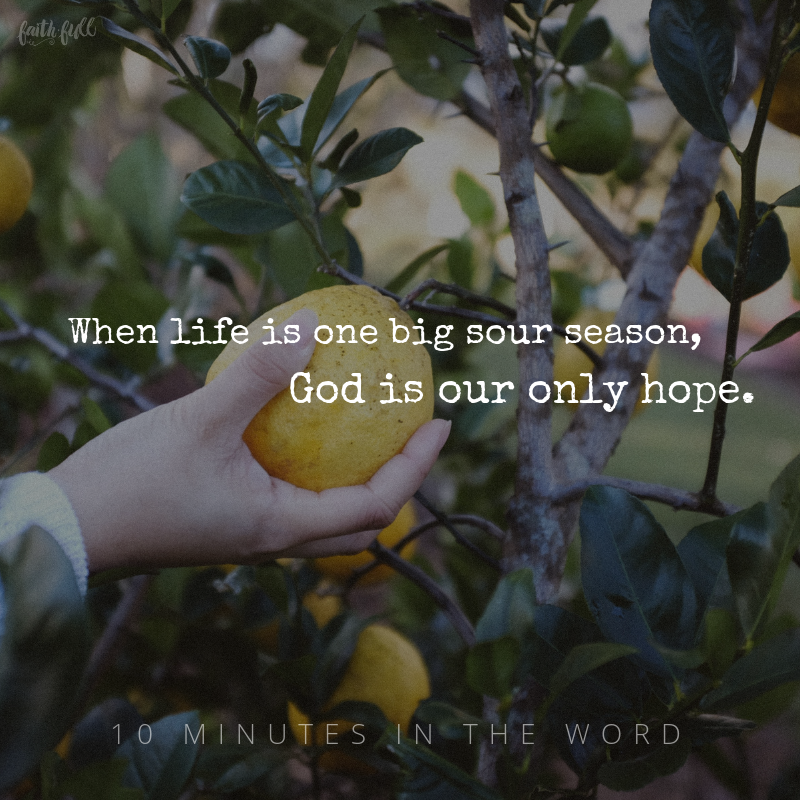 When all other hopes fail, when life is one big sour season, God is our only hope to bring us through while revealing more of Himself, His love, and His faithfulness, in the process. Lord, please help me to keep my eyes fixed on You and Your purposes for me rather than simply trying to find something good in my situations If lemonade is my only goal, I might miss Your presence, teaching, and the ministry obligations You have appointed for me. Lord, I praise You, for great is Your love and faithfulness even when I am without merit to receive it. You have delivered my soul from death, my eyes from tears, and my feet from stumbling Your love endures forever. Let us not be satisfied with only finding the good in the difficult and messy work of life, but with finding the goodness of God in it as well.